Oh my! 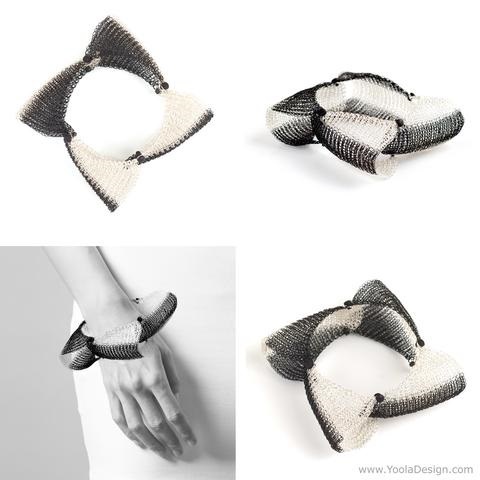 Yael of Yoola Design has a new tutorial that is truly in the art jewelry category. 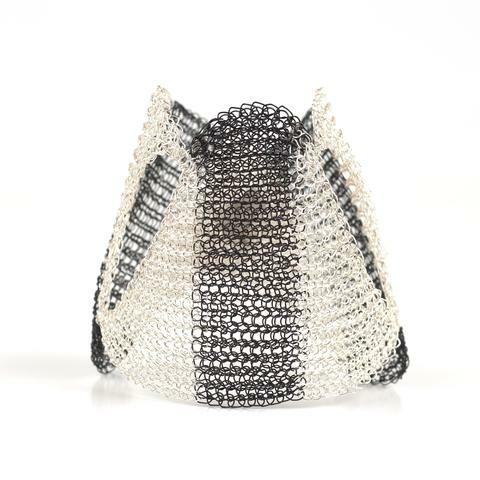 As many of you know already, she is known for her range of outstanding contemporary wire jewelry designs well as kits and tutorials available to those who wish to learn. One lucky winner will receive her new Shogun Element bracelet tutorial and kit in this giveaway. 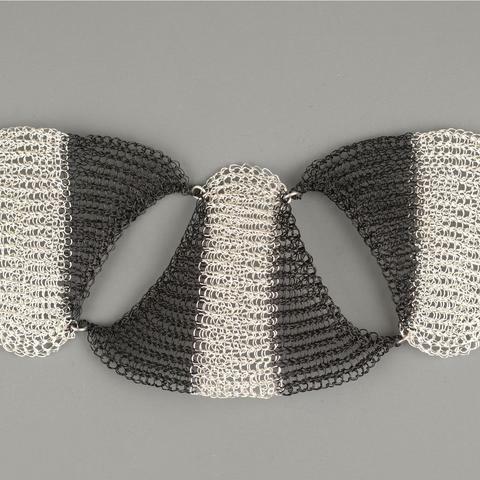 Opinion is divided as to whether her technique is wire crochet (accomplished with a crochet hook) or wire knit because the result looks like knitting stitches. 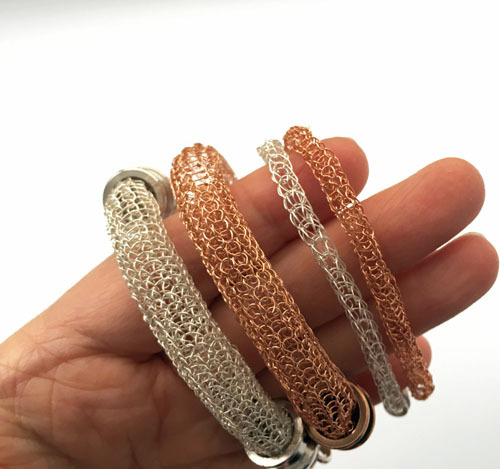 So you will note she uses both wire crochet or ISK (invisible spool knitting) terms when describing her wire jewelry technique. Yael has said that the Hebrew word is the same one for both crochet and knit. If you think about it, both techniques involve making loops. Just the tool is different. This new bracelet design is stunning. It looks best when done in two contrasting colors. The tutorial covers the creation of two types of bi-color forms which can then be assembled in different ways. It doesn't have to be a bracelet either as you can see from the necklace version below. My favorite is this gorgeous bracelet where several of the forms are linked together. It is obvious why this tutorial has art jewelry potential! The tutorial is a combination of both a PDF and a video. I found that the pictures and descriptions in the PDF are not sufficient to really understand how she does her decreasing steps. So the video is necessary. This tutorial in NOT for newbies. If you have never done wire crochet before, the Shogun Element is not the one to start the learning process with. I took a while before I could be proficient at this! I bought this basic starter loom kit (shown below) when I first started. The basic instructions are very clear to get you started. She also demonstrates how to start without the looms. But I find that the looms are helpful in getting even stitches right from the beginning. Another good set to get is the one which includes the fine crochet hooks as well as the draw plate if you don't have one. I had a lot of trouble learning with the 0.6 mm hooks. So I started with larger ones and worked my way down. I'm proud to say I can now work with these although I was stuck at 1.0 mm for a long while. Yael now supplies 0.75 mm with her starter kits. One reader, sis5of11, left an intriguing comment on a past post about the ISK technique. She said, The reason I find ISK and Viking Knit to be different is because, while they LOOK similar, VK is, I think, sturdier after being drawn, while ISK, when drawn, is a softer, more flexible chain. I think VK is more suited to jewelry for men than ISK is." That piqued my curiosity and raised a lot of questions and I felt the urge to experiment! So be sure to catch my review post later this week which goes into detail comparing Viking Knit with ISK techniques. If you'd like to win this giveaway for both a kit and tutorial for the Shogun Element Bracelet, please make a comment below. Make sure you leave contact info below if you do not have an online shop or blog. It ends in a week's time at 6 pm EST Monday, May 1, 2017. I will pick the winner randomly and announce the results as soon as possible after. So be sure to leave a contact email if you don't have an online link or make sure you come back and check! Otherwise I will redraw in a week. Good luck! These are beautiful! Would love to learn. I'm a blog follower, subscriber & Facebook fan, I can be reached at retro-grrl@hotmail.com. ISK is a fascinating technique. Ten years ago I did viking knitting and also knitting with thin cobber wire, but I started again with Yoola's nice starterset, and it was much easier and invited you to new perspectives. I love makeng it, and the new bracelet is gorgeous, I want to make it SO much. This is amazing. The structure to this looks so much like crotchet, it's hard to believe it's done with wire. I've done a lot of viking knit chains but this is on a whole new level. I'd love to win the kit and give this a whirl. Spectacular! Yolanda does it again. I would be so much fun to learn this technique. I am a blog subscriber, FB follower and Pinterest follower. This technique is new to me and I would love to give it a try. 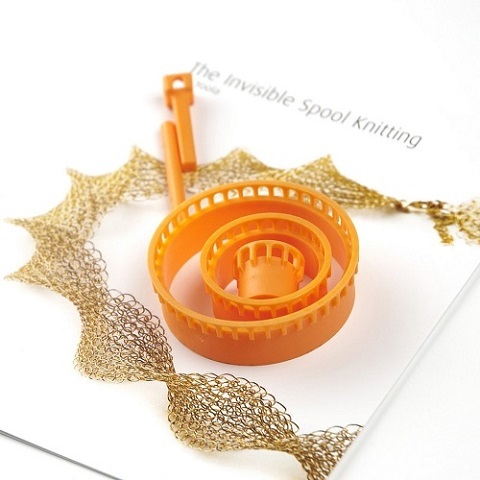 It is very different from other crocheting techniques that are done. The results look fabulous. I've been doing viking knit for a long time so would love to know the difference. Please sign me up for the giveaway. I'm a blog follower. I've made lots of Yoola's patterns. This one is my favorite and I'd love to have a kit. Thanks for running this giveaway. Yael has developed some wonderful patterns for her ISK technique using her looms. I have been enjoying making some of the more simpler patterns but would love to try and challenge myself with this more advanced one. This bracelet is really beautiful. Thank you both for this give away! Thank you for this giveaway! It is fantastic! This is a challenging technique but worth learning to create such unique pieces. I'm ready to learn. I subscribe to the blog. Thanks for the chance to win and improve on another skill. Oh MAN! I love learning new jewelry making techniques. This looks challenging and very exciting. Makes my brain buzz with ideas. Looks like a lot of fun. Never knew there were tools out there for this kind of jewelry. Looks like I'm in! I've done some wire crochet, but this would be a wonderful new design to try. 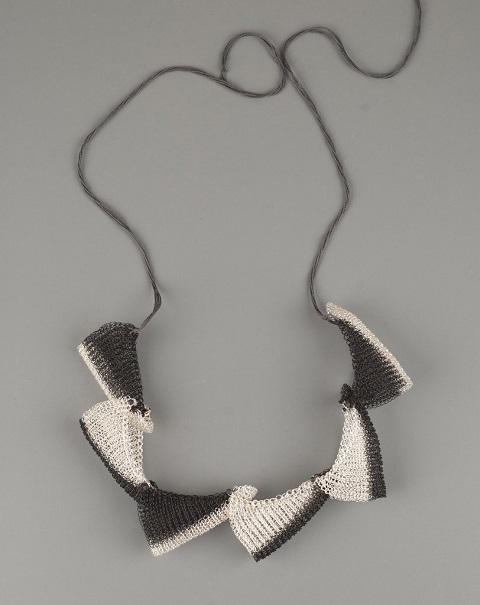 Love the delicate look of crochet jewelry. Looks like fun to try! Thanks for the giveaway. Love the art form she created. I am blog subscriber. I would love to try one of the Isk technique/ pattens. Thanks for the opportunity. I would love to win this and learn how to make this jewelry thanks for the chance to win! !